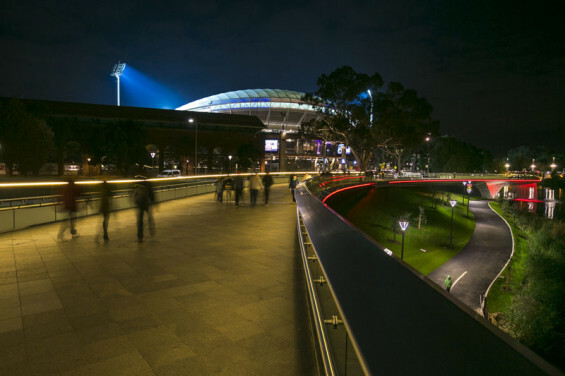 A new $40m pedestrian bridge has recently opened in Adelaide, providing a vital connection between the city’s highly visited Adelaide Festival Centre, Adelaide Railway Station and the recently redeveloped Adelaide Oval. 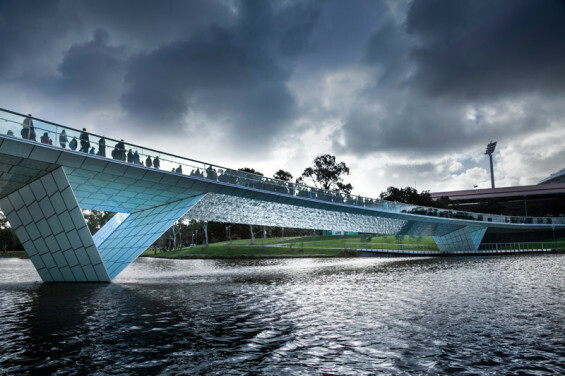 Taylor Cullity Lethlean (TCL), Aurecon and Tonkin Zulaikha Greer (TZG) were engaged in 2012 to design the new Riverbank Bridge, following a design competition run by the South Australian Government Department of Planning, Transport and Infrastructure (DPTI). The 255 metre long bridge, constructed by McConnell Dowell, was temporarily opened for The Ashes cricket series in December 2013, while it was still under construction. 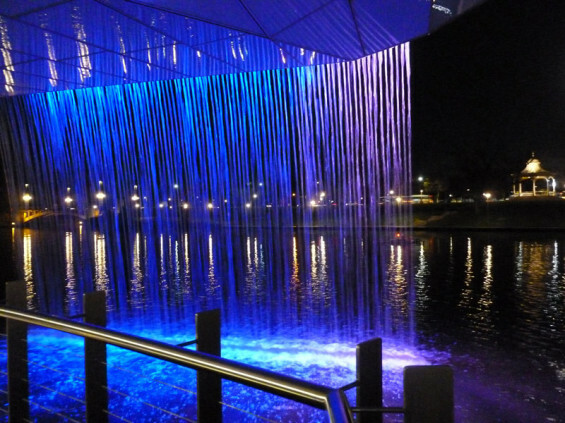 Now fully complete, the bridge is a must-visit destination, encouraging interaction with water through an integrated water feature and illuminating the Riverbank precinct at night. 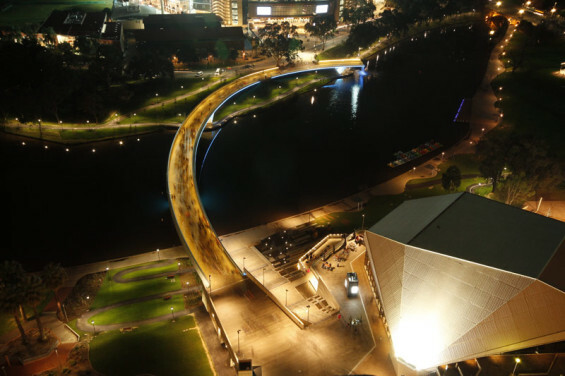 The bridge arc has been designed to mirror the River Torrens and pivot to connect two key destination points on the north and south banks. 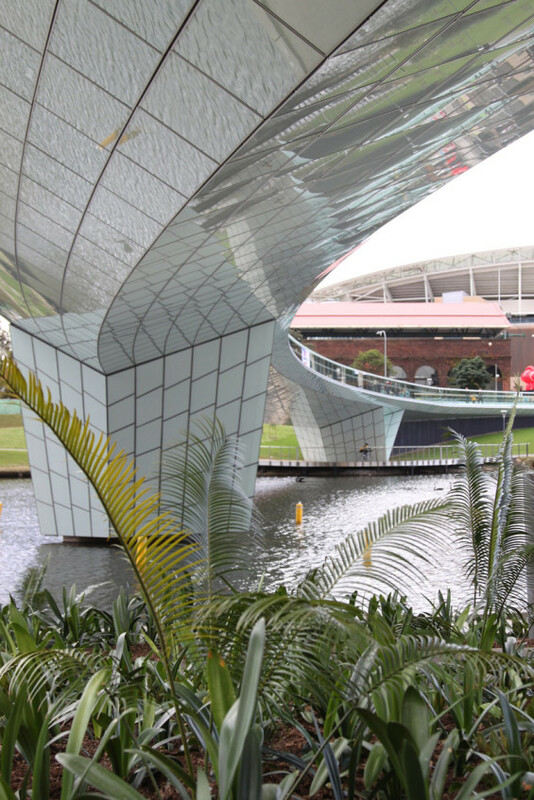 ‘The beauty of the bridge arc lies in its purity of form, and the way the bridge glides past the north bank to cantilever out over the water, culminating in a stunning water feature,’ said TCL Associate, Lisa Howard. 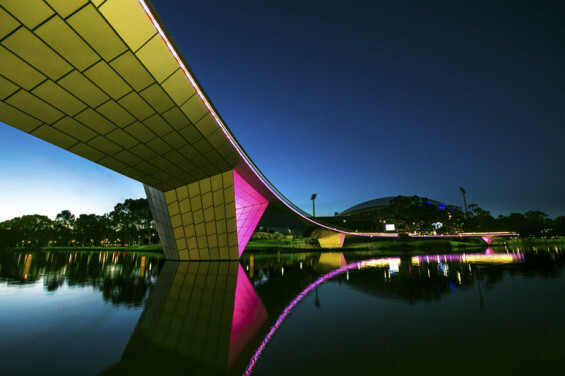 According to Peter Tonkin, Director of TZG, the notion of ‘touching the ground lightly’ drove the design team to consider a method that would allow the bridge to be supported by a seemingly minimal structure. 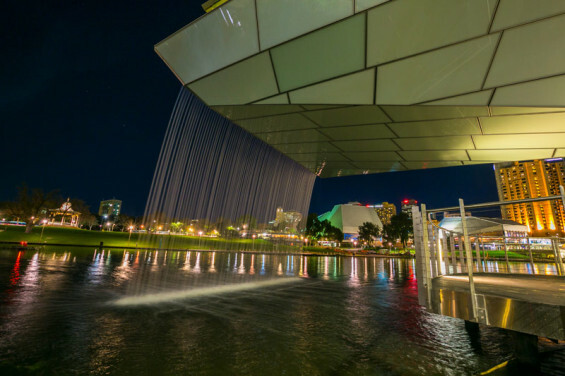 ‘It was important to the team that a single pier within the Torrens could suspend the bridge, emphasising the lightness,’ he said. 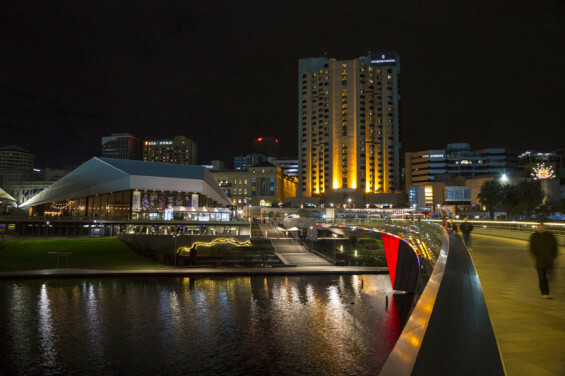 The bridge profile has been minimised and clad in white glass that reflects both light and water throughout the day, while programmable LED lighting creates a dynamic environment at night. 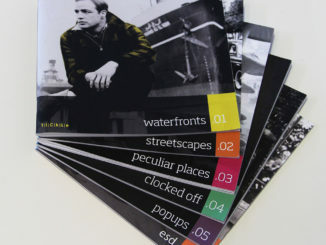 The design team worked with Cultural Consultant, Karl Telfer from Cultural Research Education and Design (CRED) to facilitate local indigenous links and storytelling within the project. The south landing hosts a stainless steel artwork where subtle traces of animals etched into the surface of the steel can be seen by day, and representations of the southern constellations can be seen by night. ‘The completion of the Riverbank Bridge invites exciting opportunities for revitalising the parts of the city that connect to this precinct, and stimulating investment in the visionary masterplan for the Riverbank Precinct,’ said Andrew Russell, Project Director, Aurecon.